This is a South Australian wine made to match a relaxing Mediterranean lifestyle. The soft press style is done by gently pressing the grapes without bruising the skins reducing the tannins and bitterness in the wine and aiming to leave a cleaner juice for wine making. 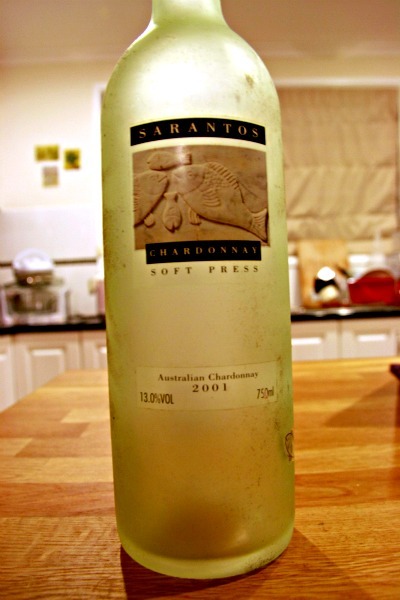 This particular wine has 11 years on it which is a long time for Chardonnay (except for the best ones!). The age gave this wine a crazy color. A very clear, golden, clean and crisp apple juice appearance, think straw or corona’s. Very enticing. The nose was a mix of cooked fruits, old dusty ripe peach, some hints of canned pineapple and some poached pears with a little bit of spiced lime. Attack has alot of alco heat (not good…), some candy cane flavours and golden delicious apples wrapped in a fresh pinewood hit. The heat diffused a little towards the mid palate (but still present) and the flavours of cooked fruits spread out like a purée with a medium to heavy body adding a slightly creamy texture to your mouth. Finish is a bit bitter and again some heat and little acidity mix. Very long and the lime kicks in here also with apple skin tannins. Hummmm…..Ok, this wine is…ok…though I don’t think its a great wine. I suspect that this was initially a cheap wine (I’m thinking $15?). A quick search show that it retails for around $10. However, this is an excellent example of what you can get from aging wine. The years have added loads of flavours and richness to the wine but not helped balance. The fact that the wine making process eliminated the tannins of the wine didn’t help either since aging wines is ment to break down the tannin structure of the wine creating a smoother wine and hopefully adds balance. Didn’t work here. Feels like there was also alot of oak in this wine during its youth. I would not age this wine if your thinking about it. I don’t think the extra 10+ years of waiting is worth the effort even though I think the aged wine would taste better than a young version. Overall, didn’t mind drinking it, though I would pass on another glass. Enjoyed what I learned from the wine and understanding what aging does to the flavour profile and texture of wines.